Cravings have a funny way of taking over your life. Or maybe that’s just me. Once I start craving something, I have a hard time thinking about anything else. 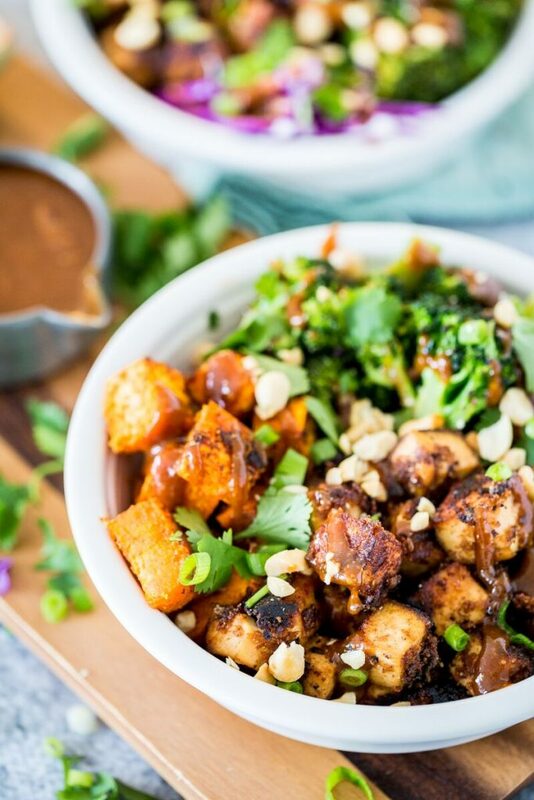 And that’s how this Thai Peanut Tofu and Sweet Potato Bowl began- as a craving. The next day, right around the same time (around 10:30am, over an hour after I’ve finished my breakfast and more that two hours before I have lunch, to be exact. Not that I’m tracking this stuff), the craving came back. But I was like, “Peanut sauce……. 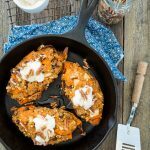 on sweet potatoes? Whaaaaaaaaat? !” Seconds later, I’m looking at some gorgeous creations on the interwebs and before I know it, I realize an hour has past and I’ve got 23 emails that all need tending to ASAP. So I said “until next time” to my craving and got back to work. I think you know the story by now. Of course the next day, when I was bored of doing work, I told myself I would take a little break so I could indulge my craving. Just get it out of my mind so I could focus on work. But things got a little carried away. Peanut sauce and sweet potatoes weren’t enough. Pretty soon, I was like “We gotta add some tofu… And cook that tofu IN the peanut sauce. Oh yeah. Maybe let it marinate in that sauce a bit, first. Oooh girl. And there’s gotta be something green. Like, brussels sprouts. Wait, no BROCCOLI! Yes, roasted broccoli! And we’ll drown it all in peanut sauce… but wait, there’s gotta be something crunchy. Let’s do some red cabbage and, uh, CHOPPED PEANUTS! YES!” But I tried googling that whole concept and there was nothing matching what was happening in my imagination. So I eagerly waited until I could duck out of work early and get myself to a grocery store to gather the things I needed to make this bowl happen that weekend. I don’t prepare full meals for dinner during the week because I don’t have the energy. I’m also not hungry since I usually have a larger lunch. So the most I’ll do is maybe toast a couple pieces of GF bread or roast a head of cauliflower to share with Chris. Sometimes it’s just a big handful of cashews. I keep it simple. I imagine that’s why I have all this pent-up cooking mojo and I’m hard-core obsessing over my most recent craving come the weekend. So Saturday morning, while I’m drinking my breakfast smoothie, the plans for how I’m going to put this meal together is flashing before my eyes, A Beautiful Mind style. 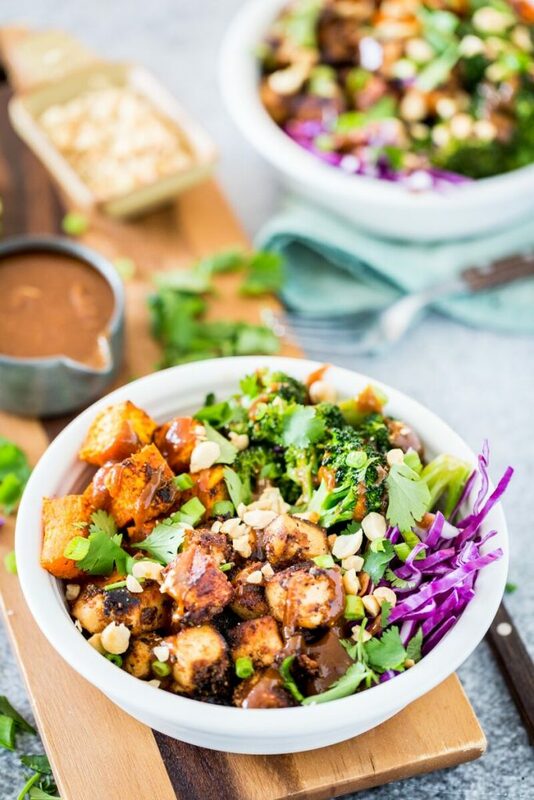 Then Chris says “Have you been listening to anything I’ve been saying?” And I admit that I have not, but tell him he’s going to love this Thai Peanut Tofu Bowl I’m going to make for dinner. Spoiler alert: He did. Preheat the oven to 425. Line a baking sheet with parchment paper and set aside. In a small bowl, combine the ingredients for the Thai Peanut Sauce and whisk until thoroughly combined and smooth. Slice your block of tofu in half, then slice each of those halves in half again, so you have 4 rectangles that are the same size as the original 2 rectangles, just thinner. Then slice each of those rectangles into about 15 cubes, for a total of 60 cubes. 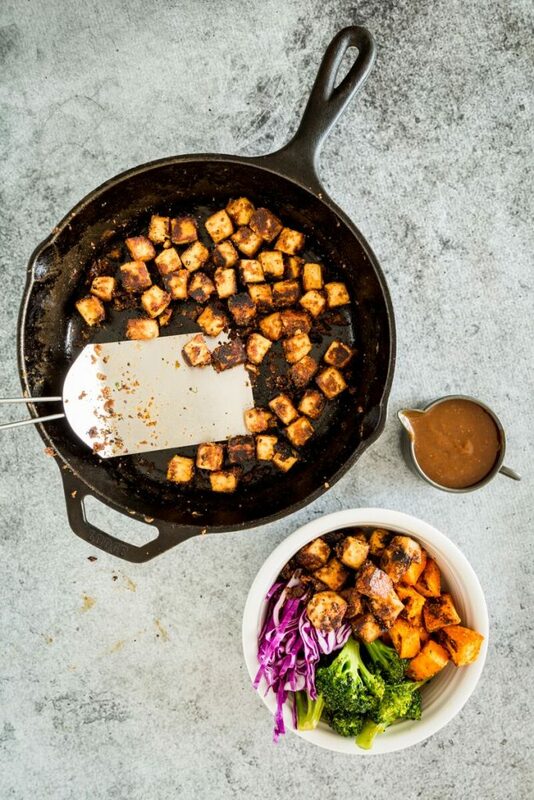 Place the tofu cubes in a medium shallow bowl and top with 1/3 cup of the peanut sauce. Stir until combined. Let the tofu marinate for about 15 minutes. While the tofu is marinating, prepare the broccoli by spreading the broccoli florets and stems on the prepared baking sheet. In a small cup, stir together the tamari/liquid aminos, maple syrup, and toasted sesame oil. Pour it over the broccoli and toss until coated. Roast in the oven for 20 minutes, tossing once after 10 minutes. You can also be roasting your cheesy roasted sweet potatoes while the broccoli is cooking as well. While the veggies are roasting, cook your tofu. Heat the sesame oil in a frying pan, preferably cast-iron, over medium heat. Add the tofu, with the sauce, to the pan and cook, stirring occasionally (gently scraping the pan as necessary), until the sauce has cooked away and the tofu is browned and slightly crispy. Remove from the heat. Add pepper to taste. 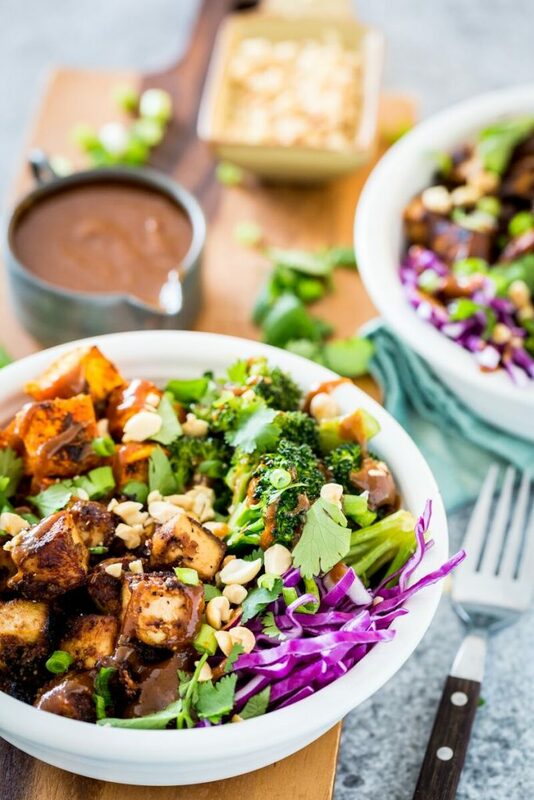 To assemble the bowls, divide the sweet potatoes, broccoli, red cabbage, and tofu amongst the bowls. Drizzle generously with the remainder of the peanut sauce. Sprinkle with green onions, cilantro, and chopped peanuts. Serve immediately. Enjoy! How do you cope with cravings? 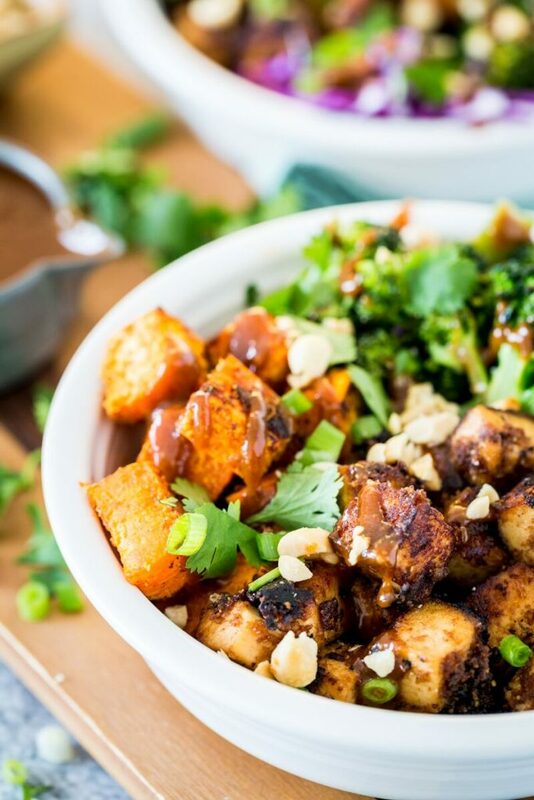 10 Responses to "Thai Peanut Tofu & Sweet Potato Bowl"
I can’t wait to try this fabulous recipe. Thanks. I cope with cravings by indulging, every time! 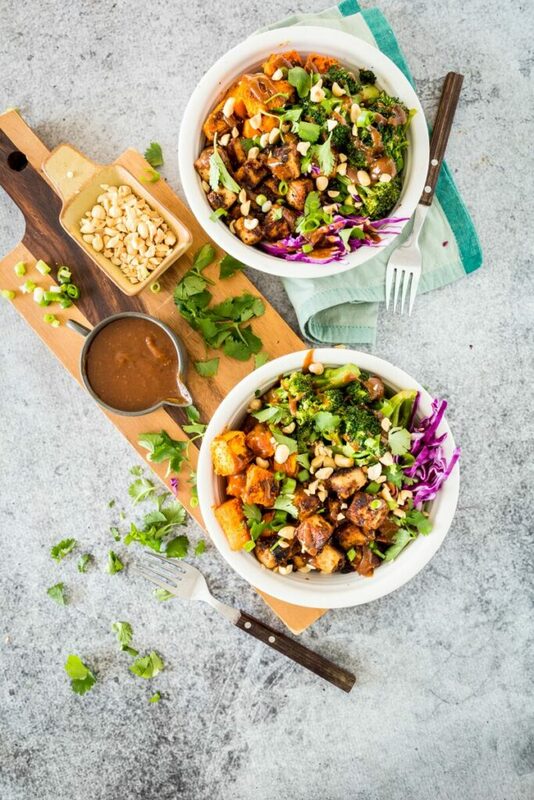 Usually in an extravagant way :P. Love this savoury tofu bowl, i can imagine how good that peanut sauce tastes on crisped tofu! O wow…. Now I have a craving for this as well! I just bought your book (But I could never go vegan!) as I am that stage right now. 🙂 I’ve just converted to vegetarian and am thinking of going all out vegan in a while. So your site is like heaven and I already love the book! So many good things I want to make. 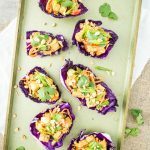 Thanks for the inspiration and this recipe is bookmarked! This bowl has so many of my favourite things, now you have given me a craving! I normally get cravings when I am at work, so can’t do anything about it (I get home too late to cook on those nights, so just have whatever leftover I pull out of the freezer), and then normally the craving goes away before I have a chance to do anything about it. Unless I am craving something from one of the several vegan friendly food places around my work, in which case it is hello spending! This is what goes down with my cravings and I. Generally speaking, I eat very healthy and I love consuming whole foods. However, if I ever feel the need, I tend to crave pretty creamy, rich, and decadent foods such as nut butters, ice cream, brownies, and cookies with a combination of a crunch factor, such as cereals, seeds, nuts, chocolate chips, crackers, anything like that! My trick is roasting broccoli until they’re incredibly crispy, or baking a sweet potato or piece of kabocha squash and drizzling some cinnamon and peanut butter on top. Both hit the spot every time! BUT. 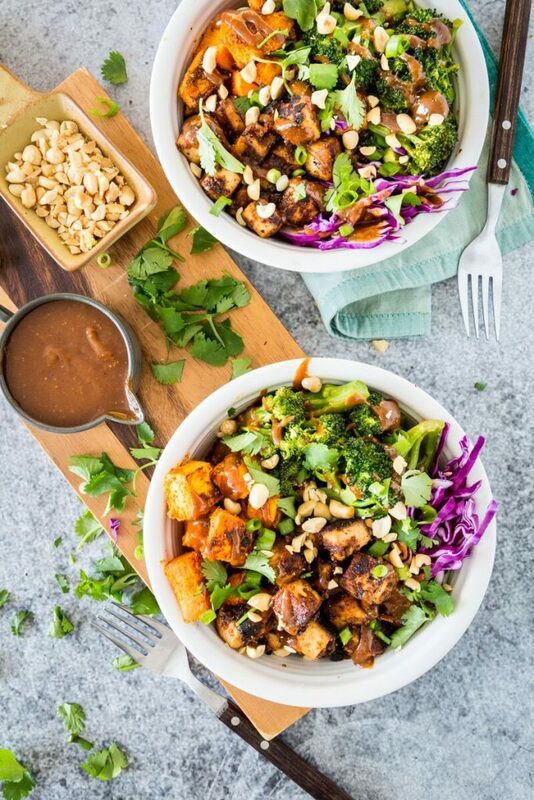 This Thai bowl probably nails all of my cravings in one. 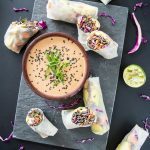 You include the creamy factor with the peanut sauce and the sweet potato, the crunch from the tofu, broccoli and peanuts, and the health factors, of course! LOVE this! Just made for dinner with Brussels sprouts instead of brocolli bc it’s what was in fridge. Very yummy and hit my Thai craving. Yay for leftovers! Just the sweet potato part.